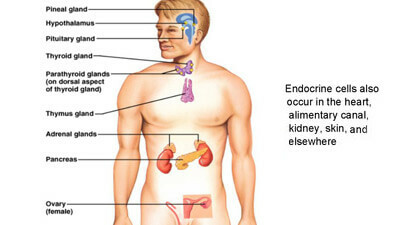 Endocrine system is an organ system in human body which consists of a collection of all the glandular structures that are involved in the secretion of hormones directly into the blood stream. The circulatory system, in turn, transports these regulatory biochemicals across the entire body and delivers them at the distant target sites for the performance of intended action. 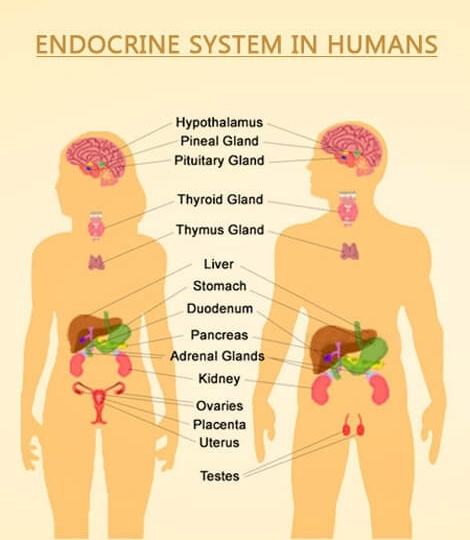 Based on the structure and mechanism of action, endocrine system offers contrast with the exocrine system, where in the latter type the hormonal substances are secreted via the ducts. Comparing endocrine system with nervous system, though the effects and mechanism of the former are classifiably different, it is an information signal system just like the latter. However, the functions of both these systems are controlled and regulated by the hypothalamus a part of the brain located inferior to thalamus, and superior and anterior to the brain stem. The ductless glands associated with the endocrine system are found at various locations throughout your body and include hypothalamus, testes, ovaries, thyroid, parathyroid, pituitary, pancreas, gastrointestinal tract, pineal gland, adrenal glands, and so on. In addition to being ductless, the endocrine glands are characterized by some other common features as well, such as vascularity and the presence of intracellular vacuoles and granules for the storage of hormones secreted by them. 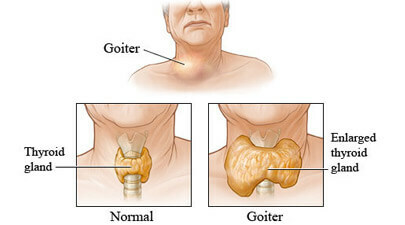 On the contrary, the glands of the exocrine nature are characterized by much less vascularity and the presence of hollow lumen or ducts for the transfer of hormones produced therein. Concerning the most important exocrine glands, you have salivary glands, mammary glands, sweat glands and liver, etc. The hormones secreted by the endocrine system of your body are said to accomplish various vital functions, for example, the control and regulation of body’s growth, metabolic activities, and the development and functioning of sexuality. Healthy sleep patterns and normal mood are also associated with the balance of hormones in the body. The chemical emissions, produced by our endocrine system, have been found to influence almost every single organ and its function in your body. Whenever you find that the hormonal secretions are either too low or too high, it must be an indication of abnormal endocrine system functioning. In case of these fluctuations in the hormonal secretion, the regular beat of your heart may get disturbed; the growth of bones and tissues may suffer from retardation; and even your ability to make babies is liable to be severely affected. 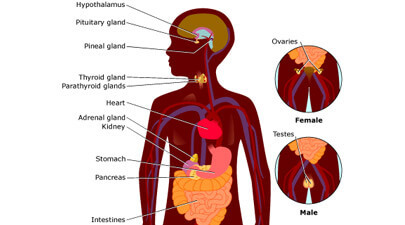 The malfunctioning of the endocrine system may lead to the development of conditions, like thyroid disorder, diabetes, sexual dysfunction, growth disorder as well as a host of other hormone-related abnormalities. The best ever way to avoid any of such disorders, related to the human endocrine system, is to adopt precautionary measures and take appropriate steps in advance. However, if somehow you fall victim to any of these diseases, you are advised to consult the concerned doctor as soon as possible. 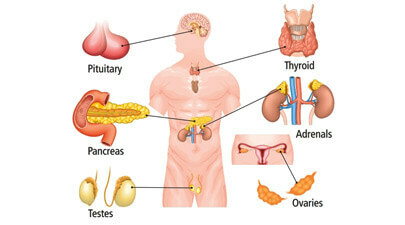 Informative Articles About "Human Endocrine System"